Newlyweds Prince Harry and Meghan Markle released stunning official wedding photos on Monday. The 33-year-old prince royal and 36-year-old American actress, now the duke and duchess of Sussex, released three photos from Saturday's nuptials. Kensington Palace said the photos were taken by photographer Alexi Lubomirski at Windsor Castle following Harry and Markle's carriage procession through Windsor Town on their wedding day. Two of the photos were staged in the Green Drawing Room of Windsor Castle. One shows Harry and Markle with Queen Elizabeth II and other members of the royal family, while the other shows the couple with their bridesmaids and page boys. "The Duke and Duchess of Sussex with the Bridesmaids and Page Boys, taken by photographer Alexi Lubomirski in the Green Drawing Room of Windsor Castle. #RoyalWedding," the palace said. The third photo, a black and white snapshot, captures a sweet moment between Harry and Markle. "The Duke and Duchess would like to thank everyone who took part in the celebrations of their Wedding," the palace said. 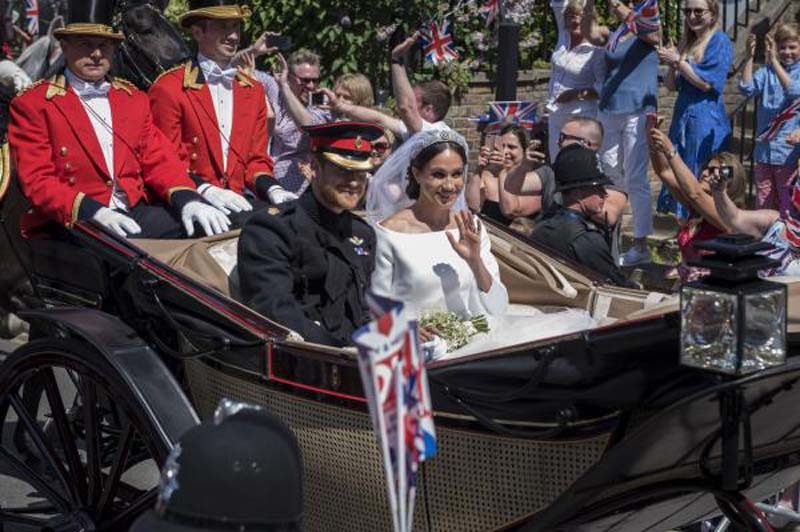 "They feel so lucky to have been able to share their day with all those gathered in Windsor and those who watched on television across the UK, Commonwealth, and around the world." Harry and Markle tied the knot at St. George's Chapel at Windsor Castle. George and Amal Clooney, Serena Williams and Alex Ohanian, David and Victoria Beckham, and Oprah Winfrey were among the celebrity guests in attendance.